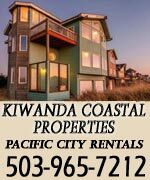 (Oregon Coast) – There’s nothing like sleeping beneath the stars, with the sound of the waves lulling you into dreamland just a ways away. Oregon’s coastal campgrounds do nothing short of rock, providing a multitude of pleasures and ways to really rough it – or just slightly rough it. They feature primitive campgrounds, sites with various amenities, yurts that feel like home away from home (in a Genghis Kahn kind of way) or full electrical sites that come with cable TV hookups where you can take in the pleasures of The Sopranos reruns or the new Dr. Who. 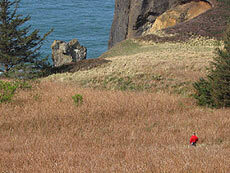 It runs the gamut of prehistoric to plush on Oregon’s coast. 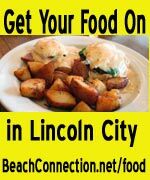 (If you’re thinking of simply sleeping on the beach, click here for a myriad of reasons to not do so). 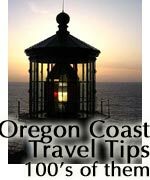 This guide to Oregon coast campgrounds features all state, county and U.S. Forest Service campsites between Warrenton and Florence – some 180 miles worth. Fort Stevens State Park. It’s the biggest park west of the Mississippi, featuring camping, old battlements that have seen the Civil War all the way up to a small shelling by a Japanese sub in WWII, and one of the world’s most photographed shipwrecks. 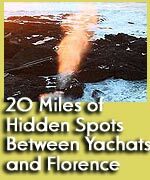 There are 174 full hook-up sites, about 302 with water and power, approximately 19 tent sites, various RV sites as well as 15 yurts. Hiker/biker campsites are by request. Hot showers and full restrooms add to the outdoor pleasures here. 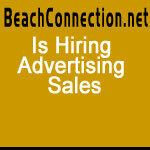 (503) 861-1671 or (800) 551-6949 (information only). Other gunnery areas exist in Fort Stevens as well, including the guided underground tour, which only takes place in the summer. Some of these were commissioned during the Civil War. Some smaller gunneries have been turned into bird nesting areas and wildlife refuges. It’s here where the wreck of the Peter Iredale sits and slowly rusts to pieces – a schooner that crashed about 100 years ago. 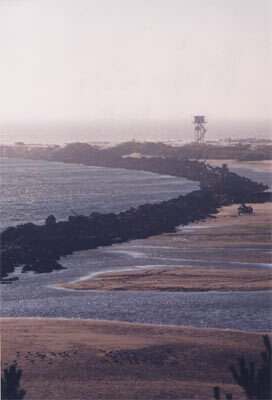 The park also houses the very northwestern most tip of Oregon: the area where the south jetty juts out into the Columbia River mouth. Secrets about here, including the camping possibilities. There are the remnants of an old army bunker in the brush at some point along this magnificent trail. Starting at the Cannon Beach side, begin your jaunt at Ecola Point in Ecola State Park and hike 1.5 miles to the parking lot at Indian Beach. Continue on another 1.5 miles from there and you'll get to Tillamook Head's point and see the bunker, find a primitive camping spot for hikers as well as enjoy breathtaking views of a rugged beach and the lighthouse. Oswald West State Park. NOTE: THIS CAMPSITE IS SHUT DOWN, BUT INFORMATION HERE REMAINS FOR HISTORICAL, SENTIMENTAL PURPOSES. This sprawling, forested oasis runs along the highway for over five miles, encompassing trails through thick rainforests, headlands, viewpoints, primitive campgrounds and some beautiful beach spots. There are day-use areas about MP 39 on both sides of the highway. These allow you access to the campgrounds, trails to Short Sand Beach and the 5-mile roundtrip hike to Cape Falcon and its viewpoints. About a third of a mile into the forest sits the 30 primitive campsites. State authorities will actually provide you with wheelbarrows to haul in your camping gear with, and there are fireplaces and firewood as well. There’s flushing toilets and running cold water. 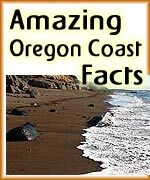 The Cape Falcon hike is part of the Oregon Coast Trail system, and allows you the option an 8-mile-long hike to Arch Cape or the 2.5-mile trek to the top of Cape Falcon and a host of forbidden sights. 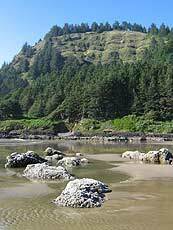 Nehalem Bay State Park. 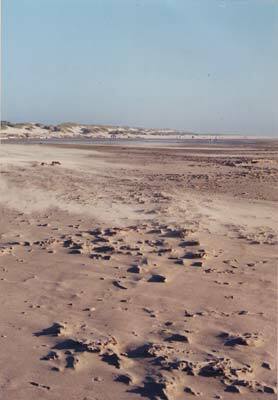 At the north end of Nehalem, this sprawling shoreline of nothing but sand goes on for over two miles. A good two miles down the sand spit you may find spots to watch seals rather closely. But don't get too close: bothering them in their natural habitat is illegal. Barview Jetty County Park. 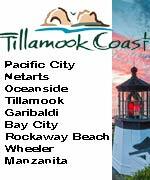 Run by Tillamook County, you’ll find about 293 campsites sitting on the edge of Tillamook Bay, overlooking both the bay and the ocean. 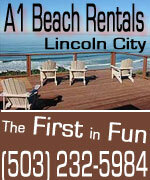 Most of the full amenities pack this little gem in the rough, including restrooms, showers, RV hookups and much more. There are 219 tent sites and 69 RV sites. At first view, Barview seems just a small community made of some homes, a couple of businesses and perhaps serving the purpose of being the gateway to either Rockaway (to its north) or to Garibaldi (to its immediate south). But the park reveals a long, slightly alien-looking beach which wraps around the bay mouth and the oceanfront, with a funky old, dilapidated platform sitting on the south end which just begs for climbing and an interesting mix of rock, sand, bay and ocean environments. There’s even access to the jetty, which is always a kick in the pants. Trask River County Campground/Park. 66 sites for your camping pleasure, about 12 miles up Trask River Road. (503) 842-4559. Fees. Cape Lookout State Park. You’ll find this monster of a campground where Whiskey Creek Road becomes Cape Lookout, hence the milepost that reads MP 0 here (even though you’ve been traveling several miles from whatever direction you’re coming from). The beach at this popular park is mostly one immense, sandy stretch, going on for nearly five miles to the north into Netarts Spit. Parts of the beach dip steeply into the tide line, causing the waves to crash loudly and abruptly, then quickly running out of steam and altogether creating an intense, natural spectacle. You can hike the spit for a few miles up towards Netarts (it’s not possible to access the spit if the tide is too high). Or take the half-mile walk up a small, inland trail of meadows that allows periodic glimpses of the beach, but no access. 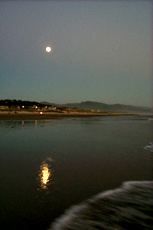 Sand Beach is divided into the East Dunes campground, the West Winds campground area and the Fisherman Day-Use area. In between these sections, there are numerous sandy trails meandering throughout the small, brownish pines. Over 100 campsites are here, although some are unofficial camping areas where people bed down in an open sandy area that’s cordoned off from the raging ATV’s. In this area, there are no reservations or designated spots, but the rest of the official campground requires reservations. From Sand Beach northward, it's a sandy, grassy, dune-covered stretch of about 4 miles until the secretive cove at the bottom of Cape Lookout - and not much else. But after the first mile it's usually pure solitude as you leave the roaring ATV's far behind. It’s run by the Forest Service. 877-444-6777. Whalen Island Park. Run by Tillamook County, 30 campsites sit on a funky little island surrounding by sandy marshes, with secret ruins lurking in the woods. It’s still a short drive from the ocean. South of Tillamook, between Sandlake and Pacific City, about four miles north of town. 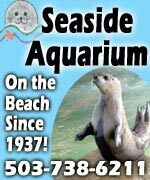 (503) 965.5001. Fees. Hart's Camp, Pacific City. Luxury camping, no effort required. Vintage Airstreams with an upscale build create a new kind of luxury camping, containing all the high-end amenities you'd find at a fine hotel. Some pet friendly. 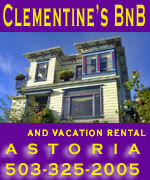 Each comes with flat screen TV's, cable, DVD players, plush pillows and fine linens and towels. Full bathrooms and indoor showers, plus each manicured grassy space has an outdoor shower covered in living plants. The park also has communal shower and restroom facilities. Each Airstream comes with kitchens, fridge / freezer, coffee maker, plenty of utensils, and high-end dishes for entertaining. Other features: fire pits, wi-fi, outdoor gas grill, Adirondack chairs and bikes to borrow. Some spaces have a gate that can be combined with others to accommodate large groups. Perfect for small family reunions, other small gatherings. All just east of the Inn at Cape Kiwanda. Off Brooten Road, Pacific City, Oregon. 503-965-5776. Hart's Camp Website here. Castle Rock Campground. Another US Forest Service campsite, this primitive one is tucked away deep in the lush, forested canopy of Highway 22, between Highway 18 and Highway 101. 4 miles from Hebo. Allows pets. Free. 503-392-3161. Hebo Lake Campground. Another community that would simply be a hole-in-the-wall were it not for the kooky Hebo Inn (with the backwards N’s) and access to the stunning vistas of Mt. Hebo. A bit inland, along the section of Highway 101 between Cloverdale and Tillamook, look for the Hebo Lake Campground, run by the Forest Service. It’s said that atop this gorgeous, rather hidden spot the stars open up with amazing clarity on cloudless nights, making it famous for being one of the most romantic spots in Oregon. It’s five miles from Hebo, up Forest Service Road #14. Allows pets; hiking trails. 503-392-3161. Devils Lake State Recreational Area. 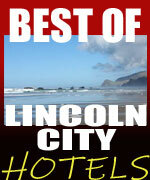 Coming into Lincoln City from the north, you’ll find East Devil’s Lake Rd. Take that to reach this favorite camping, fishing and boating spot. There are 55 tent sites, 10 yurt spots, paved parking and a load of other amenities in the campground. There is a northern access to the lake by the big outlet mall: head east at the traffic light at NE 6th St.
Canoe or kayak to your heart’s delight on the lake at the only coastal campground located in the middle of a city. Kayak tours of the lake are scheduled in the summer (the state provides the kayak). Jack Morgan Park. This county park is located up State Highway 229, up the Siletz River, there are eleven acres that straddle the road, providing boat ramp access, concrete vault restrooms and a picnic area with tables, along with the plentiful fishing. Elk City Park. 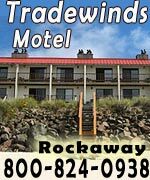 It’s 22 miles upstream from the mouth of the Yaquina River, with twelve campsites, restrooms, wheelchair facilities, flush toilets, dock, concrete boat ramp and barbecues. Fees. Beverly Beach State Park. Access to this popular state park and campground is on the east side of the highway, just south of the southern entrance to the Otter Crest Loop and the Devil’s Punchbowl. Some 273 campsites stuff this popular park, with a beach access via a tunnel underneath Highway 101. From there, you’ve got a mile and a half of sand to the north before you reach the Devil’s Punchbowl. 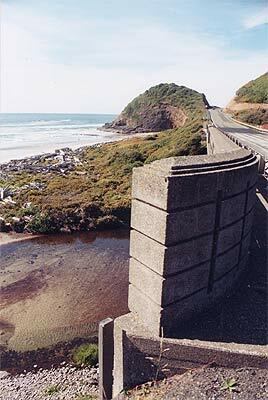 To the south, there’s a whole four miles of beach before you’re stopped by Yaquina Head. South Beach State Park. You enter this enormous area almost a mile after the South Beach business district ends, and then it stretches all the way northward back to the South Beach jetty. Sand, sand and more sand occupy this beach, while the park itself sprawls for about a mile worth of roads. It’s filled with large, green grassy areas, plenty of trees, a host of facilities and 260 campsites. 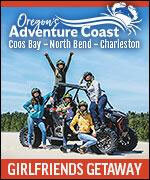 South Beach includes: 38 electrical (maximum site 60 feet); 6 primitive; 22 yurts; group tent (3 areas); hiker/biker camp. Volleyball and basketball court. 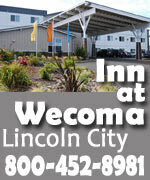 For information only, call (541) 867-4715 or (800) 551-6949. 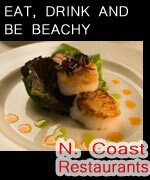 To make reservations, call 1-800-452-5687. Beachside Recreation Site. South of Waldport, this beautiful little place is so close to the ocean waves that at some times of the year it’s prone to flooding and shut down. Still, 32 campsites (with water and electricity) and 50 tent sites make this one a regular family favorite for many. 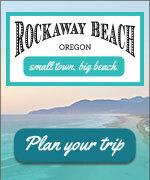 Hot showers, full restrooms and access to a big, sandy beach help round out the equation. Tillicum Beach Campground. This well-maintained campground is a gem on the coast. 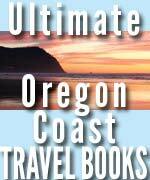 Smack dab between Waldport and Yachats, it’s a longtime favorite among those in the know. 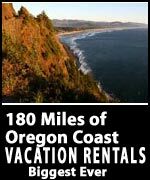 Cape Perpetua and Campsites. A few miles south of the village of Yachats, the world becomes a forested canopy and the surf a raging monster along miles of craggy, jagged basalt. 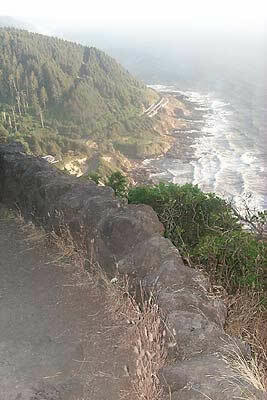 As soon as you get to this road, veer immediately right to go to the Cape Perpetua Campground. 37 sites inhabit this beautiful, wooded spot, with each site accepting RV’s as long as 22 feet and coming complete with fireplaces. Carl G. Washburne State Park. It’s a ways into the forested area just beyond the Ponsler Wayside (about two miles south), with an entrance almost hidden by the trees if not for the prominent State Park sign pointing it out. 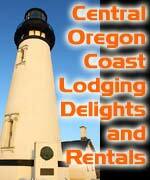 It’s also a big one on the coast, with 58 full-hookup campsites, yurts, six walk-in tent sites and fireplaces. The campground includes a hiker/biker camp, some wheelchair access and hot showers and full restrooms are also available. 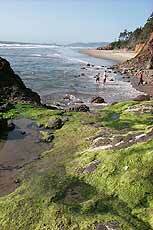 There’s an easy trail to the beach, containing miles of sand and some surprises. From the main beach access, head south and for the next mile or so you'll find beautiful little cove-like places, the first of which is only a quarter mile down the beach. Some of these are only maybe 30 feet wide and 20 feet deep - which makes them perfect for letting the rays in but keeping the wind out. Alder Dune Campground. The U.S. Forest Service-run Alder Dune features 17 campsites and full amenities, plus access to all sorts of dunes and nearby Baker Beach. There are RV sites as well. You’ll find picnic tables and three pristine lakes in the middle of the dunes, two of which are primed with trout periodically. The main parking lot and its lake make a beautiful, pastoral respite, with added value given by the viewing platform. Harbor Vista County Park. Harbor Vista, within Florence, is one of Oregon’s lovely little secrets. There are 38 campsites here, spread around an area which overlooks the north jetty of the Siusilaw River. There is a gorgeous little viewpoint looking over that jetty, with a long but wonderfully convenient pathway leading down to the beaches. The pathway even features steps embedded in it most of the way, making it much easier for the climb back up. Honeyman State Park. Dunes, dunes and more dunes occupy this famous spot just south of Florence. 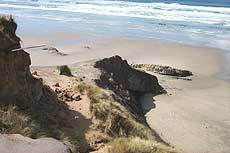 It essentially comprises the southern shore of the Siuslaw River and it’s the gateway to the 40-mile-long Oregon Dunes National Recreation Area. Various clear water lakes are found here, sitting in the middle of the enormous, sometimes towering dunes. Campgrounds abound, with 50 sites with full hook-ups, 91 with water and electricity and a whopping 237 primitive tent/RV sites – all with fireplaces and other amenities. There’s also plenty of surfing to be done here, although you have to head through the park access and prove you’re heading to the northern area (south jetty) to avoid the state park charges.